When I saw that Apple acquired Australian company Authentec earlier this month, the first person I thought of was John Peters, co-founder and CEO of Gentag and inventor of near field communication (NFC) technology. I interviewed Peters after last winter’s mHealth Summit and predicted at the time that Apple would include NFC technology in their next generation of iPad and iPhone devices. When the new iPad launched this Spring I was a bit surprised it did not include NFC, but after thinking about it a bit I realized the iPad isn’t the ideal device to introduce NFC since it’s mostly intended to be used in the home, while the most compelling applications of the technology are really in the mobile setting. We all know the new iPhone will be unveiled next week and while Cupertino has lived up to its reputation for secrecy once again, there are tea leaves to be read this time which indicate a good reason to think NFC could be the key new feature technology in this next generation phone. As I mentioned above, Apple recently acquired Melbourne-based Authentec, which specializes in developing NFC security technology which protects virtual wallet apps, and uses fingerprints to ensure they are only accessible by the actual owner. If I was John Peters when I heard about the Authentec acquisition, I would have been doing backflips, because to me this deal nearly guarantees NFC will be included in the upcoming iPhone. While the biggest immediate business opportunity for NFC is in the mobile payment space, I think there are scores of potential mHealth applications we can expect to pop up in the months following the iPhone 5 announcement. For instance, stick on temperature sensors that send a notification to the phone once a pre-defined threshold is met/surpassed, or pressure sensors beneath foot casts which send alerts to wearers when specific pressure thresholds are met/surpassed. 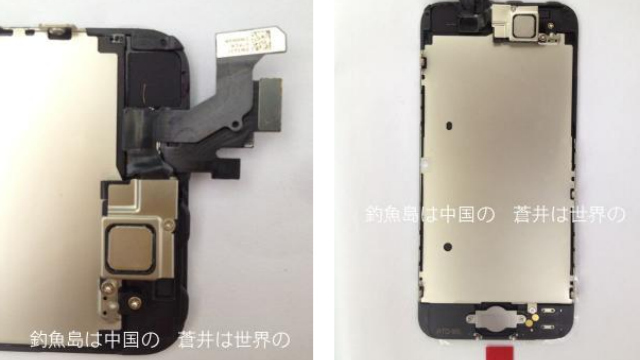 Sure enough, there are rumors of leaked images of the soon to be released iPhone 5 (below) which seem to indicate the inclusion of a front-facing NFC chip. This would make sense considering the newest technology developed by Authentec had featured a similar front-facing chip and the patents filed by Apple in the past which included NFC technology had placed the chip in the same place it is shown in the leaked photos below. I can also think of one reason why I might be wrong. As John Peters told me during our interview, he developed and patented NFC technology jointly with Motorola in 2003, together the companies have been issued 10 patents with an additional 61 pending. It would be logical to conclude that these patents are now the property of Google following their recent acquisition of Motorola Mobility. But, I don’t think its unreasonable to think Apple would license the technology from Motorola. Apple does, after all, license a number of components used in their devices from Samsung, the Korean company against whom they just fought and won a brutal patent suit which seems to have had little, if any, effect on their existing business relationship. However, Google is now much more of a direct competitor now that they have their own hardware company, so perhaps Apple will seek alternatives to NFC. A different argument against the inclusion of NFC is also made by Anand Tech, based on the size and placement of the coil needed to make an NFC sensor. 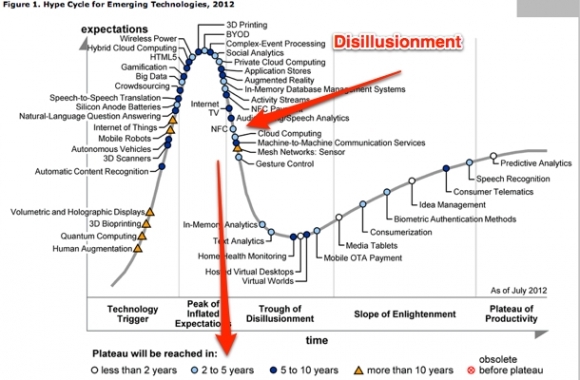 The image below is the annual Gartner “Hype Cycle”. It shows NFC losing some of its hype value since last year, when it was at the pinnacle of the “Peak of Inflated Expectation”. Gartner believes the technology is headed for the “Plateau of Productivity” in the next 2-5 years, which I take to mean it will achieve widespread consumer adoption. To me, this analysis makes a great deal of sense, particularly if Apple includes the technology in its next generation iPhone. 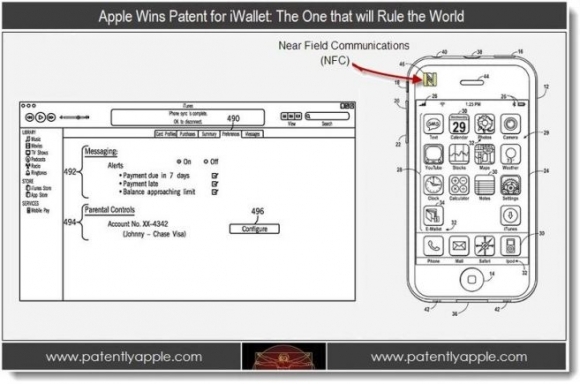 i agree with you in that I wish that the iPhone 5 would arrive with NFC, but i HIGHLY doubt that this will happen. The well-sourced John Gruber (of DaringFireball.net) and Jim Dalrymple from TheLoop have corroborated with Anandtech’s report that the iPhone 5 will not have NFC due. Either way, I’m looking forward to the announcement! Thank you for your comment David. I saw the article in Anandtech and I though it was very poorly written. For example, at one point when discussing the new Apple Passport app the authors seriously propose that Bluetooth Low Energy could be a viable option for wireless payments, which is ridiculous since Bluetooth requires devices to pair before data can be transferred, making it totally impractical for wireless payments. Plus that piece didn’t even address the acquisition of Authentec, which is a deal that only makes sense if Apple is serious about NFC. John Gruber may have great sources, but in my opinion he doesn’t know the first thing about this technology. I think you bring up good points Brian, but I’d have to agree with what David mentioned. Anandtech is a benchmark in the tech industry, so I’d be careful at being overly critical of their work. Also, I would hesitate to say that Gruber doesn’t know the first thing about technology. That’s a completely off base comment — Gruber is another standard bearer in the industry and has a proven track record on new technologies and if you read his site on a daily basis, which I do, he has a keen insight into technology. He built his reputation from the ground up, and it’s not a coincidence that millions read and follow him. There is something to be said when the most valuable company on the planet actually cares what Gruber writes and thinks — Apple actually does think he knows a thing a two about technology. First of all, I did not say he doesn’t know the first thing about technology generally, I said he doesn’t know the first thing about THIS technology. Lets just look at the comment in the Anandtech article I was referring to – “The inclusion of Passbook in iOS 6 is the most often-cited piece of evidence for Apple including NFC, which seems a bit paradoxical since Apple hasn’t disclosed at all whether it would favor NFC or a Bluetooth LE (low-energy) or even QR code based payment token through that gateway.” That is not a well informed comment because as I said above, Bluetooth LE does not make sense at all for mobile payments. If you disagree with this please tell me. I also think its naive to simply analyze the picture in question and not look at the larger context of the Apple acquisition of Authentec, which is not mentioned once in the Anandtech post, despite the fact that Apple paid over $300 million for the company and its primary technology is based on NFC. I don’t know how you could call this a well sourced article if it doesn’t even mention the recent Apple deals that are directly related to NFC technology. I will say, the Anandtech post does a good job of explaining the technical principals of NFC and how it is incorporated into Nexus devices. I will also say that I could be very wrong in my prediction. But my criticism of the Anandtech post is NOT way off base, nor was it intended to imply Gruber doesn’t know anything about technology, obviously he does have a clue, and I don’t know how that is what you got from my comment.